The development of new robot structures, in particular of parallel kinematic structures, is widely systematized by different structure synthesis methods, whereas a systematic approach for the development of micromanipulators is missing. 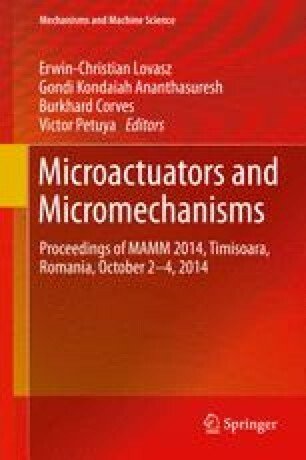 Hence the aim of this paper is to systematically develop new kinematic designs of flexure hinge based micromanipulators with three translational degrees of freedom. With the focus on screw-based approaches for the structural synthesis a structural selection is made with regard to specific characteristics of micromanipulators. Thus 11 possible configurations of new kinematic structures with a symmetrical and orthogonal assembly are shown. Finally, an internal development of a flexure hinge based micromanipulator is presented. The research work reported here was possible within a joint research project, which also includes the Laboratory for Machine Tools and Production Engineering and the Facility for Electron Microscopy of Aachen University and is funded by the German Grant Authority DFG.